I am pretty happy with the gifts I made this year for for chrismas - can't wait to figure out what to make for people next christmas and to start making them:) Maybe a bit freaky, I like to have good time in December so that I can really enjoy Christmas instead of stressing around! 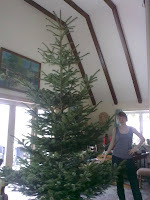 This, is our christmas tree... 4.4 meters or so..pretty high! We had to use a ladder to decorate half of the tree..
One year my dad and brother came home with a 7 meter high tree.. That was a bit too high! So after cutting of a couple of meters, we realised that tree was not so pretty in the branches at that hight - so they had to go and pick a new tree!